Many legends, including Greek sources, tell of the Amazons, warrior women from Colchis on the Black Sea. Their unusual costuming is based on ancient depictions of Amazons in Scythian style clothing and new archeological research by Professor Jeannine Davis -Kimball. The music, composed by Steven Flynn, is based on the Georgian War Dance, Khorumi, as are some traditional dance elements. Flying apsaras are divine dancers and musicians who serve and protect the Buddha. There are over 4,000 depictions of them in the famous cave frescoes of Dun Huang on the Silk Road. These celestial maidens, endowed with great beauty, also appear in Hindu legend as dancers at the court of Lord Indra in Heaven. The Bible tells of the courageous Queen Esther who pleaded to King Ahasuerus on behalf of the Jews of his kingdom, whom he had condemned to slaughter. Esther and her seven handmaidens fasted for three days before the young woman risked her life by appearing unsummoned before the king. Roxanne was the daughter of the Central Asian Soghdian ruler Oxyartes whose people were conquered by Alexander the Great. She danced for the legendary conqueror at a banquet in his honor; he was so captivated by her beauty that he married her. The Soghdians were famed for a sort of ''whirling dance.'' 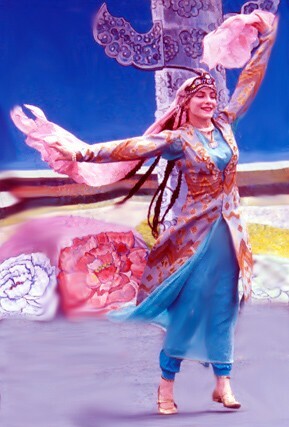 Spins and turns still can be found in present day Persian and Tajik dance. The tales of a magical woman-snake with healing powers and knowledge of the medicinal properties of plants still echo today in Anatolia. Kurds remember her too, and her name is linked with the Assyrian Queen Semiramis. Shahmaran also turns up in a story from the Arabian Nights as a snake with the head of a beautiful woman. An ancient symbol of feminine wisdom, Shahmaran is perhaps an intuitive, anthropomorphic embodiment of the double helix -- the intertwined serpent of DNA. Old Chinese chronicles contain references to ''red haired devils.'' These stories became reality when tall, red-headed mummies were discovered in Urumchi, in Western China, wrapped in plaid twill. The archeological find of these so-called ''mummies of Urumchi'' in Chinese Turkestan ranks as perhaps the oldest site of proto-Celtic peoples. This choreography is a fanciful exploration of ancient cultural exchange along the Silk Road. Zoroastrianism is an ancient spiritual tradition based on the teachings of the prophet Zoroaster; it honors Ahura Mazada as the supreme divine authority. It was once the dominant religion of old Persia, as well as parts of Central Asia and the Caucasus like Tajikistan and present-day Azerbaijan. By actively participating in life through ''good thoughts, good words, and good deeds,'' humans could foster happiness and fend off the negative forces of chaos. In Zoroastrian cosmogony, fire is an agent of ritual purity and a medium through which spiritual insight and wisdom is gained.